These are the shelling peas, but the snap peas are at the same size. The spinach is also doing fairly well. There aren't that many lettuce or carrots coming up -- I'm a little concerned that the heavy rain we had not too long after sowing the seeds dislodged them. 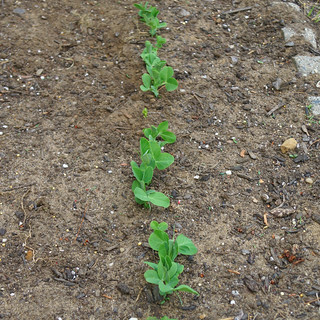 The peas and spinach seeds are larger and likely had a better time holding their own. But time will tell. 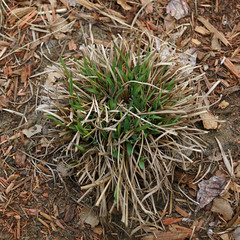 In the front yard, between the edge of the house and the side yard on the west side I planted a Big Blue Stem grass (Andropogon gerardii) last summer. I cut the dead grass back this spring and new growth is starting to sprout! Another bed that I cleaned out this spring, is directly in front of my living room. 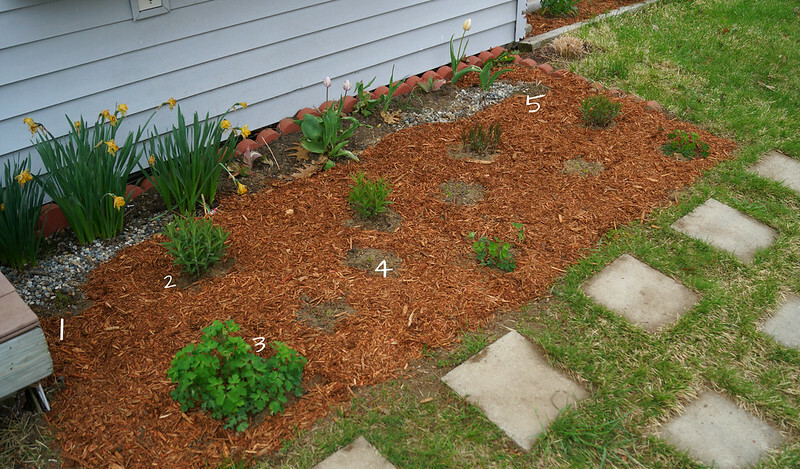 This bed is where I transplanted most of the plants from the part shade bed I mentioned above. 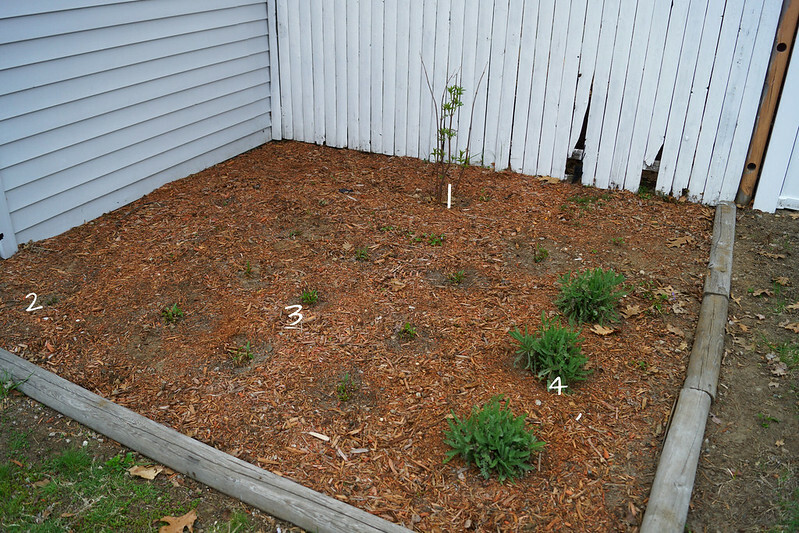 I've numbered the plants in the photo above: 1 - New York Ironweed (Vernonia noveboracensis) is a native plant. 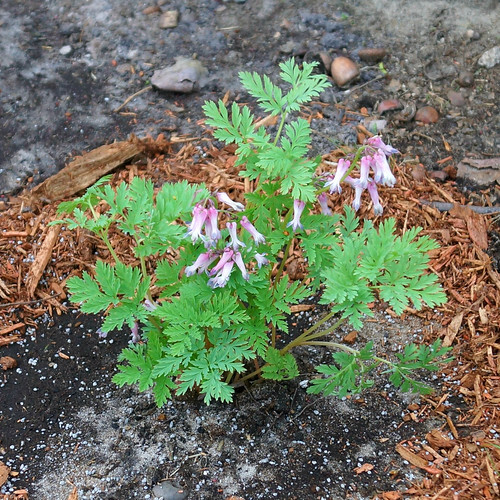 I bought this plant last summer and planted it here; it is just barely beginning to regrow from the winter. 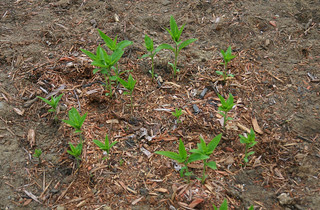 2 - Culver's Root (Veronicastrum virginicum) There are four of them in the back (in front of the daffodils and tulips) that I moved into this bed. 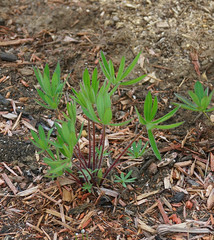 3 - Columbine (Aquilegia canadensis) There are three columbines in the front of this bed. 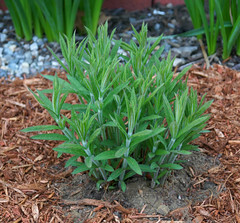 4 - Butterfly Weed (Asclepias tuberosa) is a member of the milkweed family. They are crucial to butterflies, but especially monarchs as milkweeds are the only plants that monarch caterpillars can feed on. 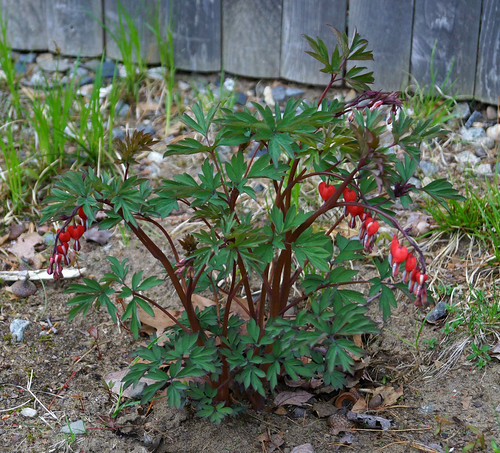 These plants don't transplant well once established, but I gambled that they weren't super established after less than one growing season. 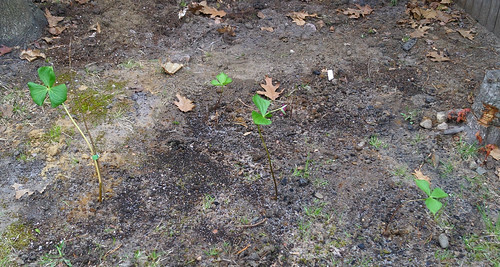 They are the four bare spots in the mulch as they are just beginning to re-sprout. 5 - Wild Senna (Senna marilandica) is hanging out in the far corner of the bed. It is also just beginning to reemerge after our long winter. Between the kitchen patio and the driveway is a narrow strip of dirt. 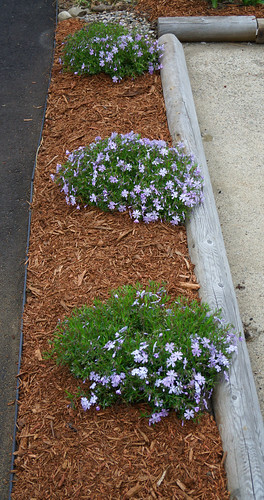 Last year, I planted three Creeping Phlox (Phlox subulata) plants. They are back and blooming beautifully. 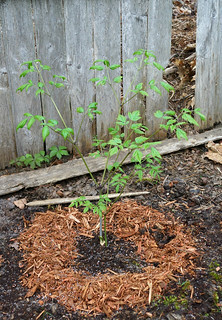 In the side yard, next to my garage is the raspberry bed, but also a good size planting bed that I created last summer. Here is what lives here: 1 - American Black Elderberry (Sambucus canadensis) is a beautiful native shrub that produces nice little berries that are a big hit with the birds. 2 - Another New York Ironweed 3 - Purple Coneflower (Echinacea purpurea) was a staple of my childhood. 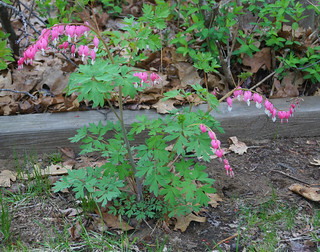 We had a big patch of them in right by the back patio and they were everywhere in the fields and ditches of the Midwest. 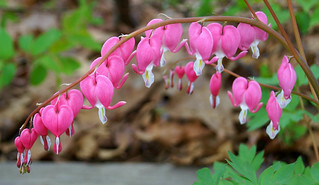 They aren't a true native plant to Maine but I love them and they do attract many pollinators. 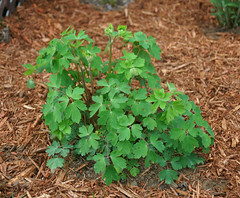 There are 10 of these in the bed, along with several smaller seedlings. 4 - Yarrow (Achillea millefolium) is a tough little native plant. There are three of them in this bed. Moving to the backyard. 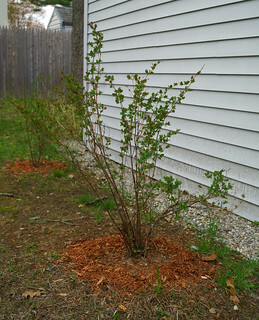 Along the garage, I put in two Snowberry bushes (Symphoricarpos albus). 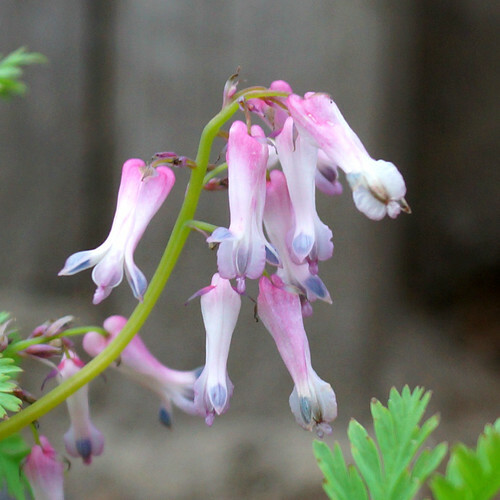 These are a nice little native shrub that I had never heard of until I saw it at a nursery last summer. They produce beautiful snow-white berries in the fall. 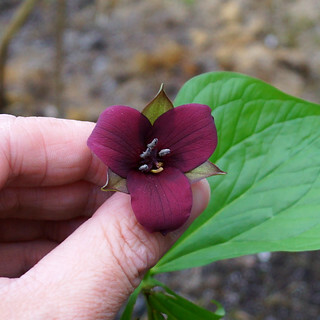 I'm not complaining as it's a beautiful flower, but it certainly looks red to me! 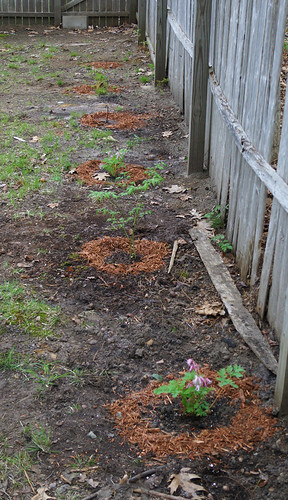 Going further along the fence, is an alternating row of Black Cohosh and Fringed Bleeding Heart (three of each). Well, I hope you enjoyed this little tour of my yard as much as I enjoyed taking the pictures and putting it together. I have so many more ideas and plans -- stick around to see what is growing next.